Welcome to my garden! Stardreamer Daylilies is nestled among the Blue Ridge Mountains in picturesque Ruckersville, Virginia, just north of Charlottesville. Surrounded by the beauty and history of the central Piedmont and Shenandoah Valley, Stardreamer Daylilies is able to grow the best of both northern hardy as well as the southern bred daylilies. 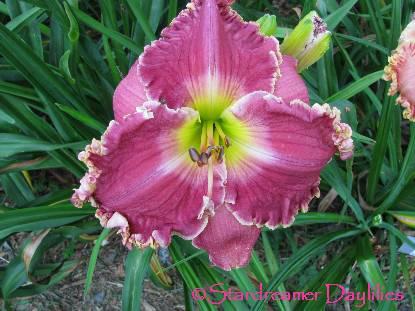 Stardreamer daylilies offers over 900 varieties for sale. There is something for everyone's taste and budget from the classic proven winners to the newest and greatest daylilies from around the country. Visitors to Stardreamer Daylilies are surely in for a treat. This two acre treasure beckons visitors to discover all its delights. Pools of sunlight shine through the many mature oaks that offer welcoming shade. 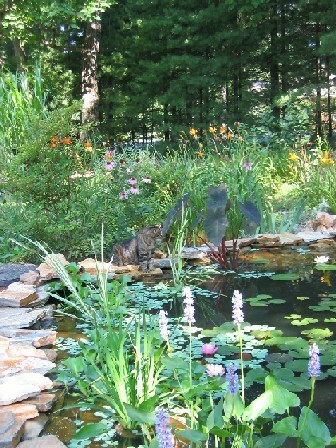 The 6000 gallon pond is a peaceful place to sit and admire the gardens. The daylilies may be the most abundant plants in the gardens, but the other special touches are sure to keep you guessing what you will next see as you wander the beautifully landscaped gardens. There is usually something in bloom from the beginning of January until the middle of November. The season starts off with hellebores in early January then goes on to daffodils, tulips, hyacinths and other spring bulbs. Roses and hostas next show up on the scene followed by perennials, elephant ears and annuals that take you right up to daylily season and continue until the mums bloom in late fall. Visitors are welcome. Please call ahead to ensure that I am here to greet you and show you around the gardens. Most days I will be able to dig your selections. You can wander the gardens choosing the colors and forms of daylilies you want to include in your garden plans, knowing your selections will all come together to make your garden a showplace of beauty. Plan to take your daylilies home that day, fresh and ready to be planted in their new homes. Shipping is available May 1st through September 30th. Please let me know your preferred shipping date when your order is being placed. I ship via USPS PRIORITY MAIL on Monday and Tuesday. A few website instructions for newcomers - if you click on the PLANTS tab, you will have several views available to choose from. Choosing the category "All-Gallery" will show thumbnails and prices for all of the plants in my garden. You can also utilize the other tabs that have been set up to view more narrowed selections. Each thumbnail can be clicked to get additional information regarding the specific cultivar. I've broken up the plants into several categories for those that might be looking for specific things (large flowers, doubles, UFs and spiders, small or miniature,or patterned daylilies etc. ), and of course there's a category for the beginning daylily enthusiasts to be able to check out daylilies that are $10 and under. This site has been accessed 2197373 times.